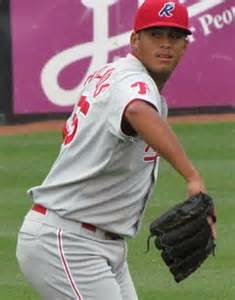 Phillies left-hander Mario Hollands was in Philadelphia this week to have a follow up exam on his surgically repaired elbow and feedback was positive. Hollands, who was the Phils' 10th round draft selection in 2010 out of UC Santa Barbara, was sidelined last year during spring training, and soon underwent UCL reconstructive (Tommy John) surgery. Nine months out from surgery, the throwing arm is healing as well as can be expected, according to team doctor Michael Ciccotti . The team anticipates that Hollands will begin throwing off a mound by late January or early February. His time table for facing batters remains to be determined, but with a month of spring training action still six weeks away, Hollands will have plenty of time to get in game shape. Keep the 27-year-old in discussions for holding down a big league bullpen spot in the first half of the coming season. In 50 games as a big league rookie in 2014, Hollands posted a 2-2 record along with a 4.40 ERA. On Tuesday, Hollands returned to Florida to continue his rehab work with team training staff at their spring training home in Clearwater. Additionally, minor league third baseman Zach Green, who missed much of last season with a broken left wrist, is fully healed and will report early to spring training by mid-week next week. Green entered the 2015 season ranked as Phillies Nation's number 13 prospect. In just 26 games for Class A Advanced Cleatwater last season, the 21-year-old righty batter sported a .173 average with a home run and seven RBI. A six-foot-three 210-pounder, Green was the Phils' 3rd round draft selection in 2012.